We've spotted a number of buying opportunities in Dow Jones stocks. Here are the 10 best. U.S. equities are driving higher on Monday as we enter the heart of the second-quarter earnings season, refusing to give into the selling pressure affecting foreign markets. The Dow Jones Industrial Average has climbed back up over the 25,000 level. As such, sentiment is off the charts, with investors bulled up over earnings. As a result, a number of big-cap Dow Jones stocks — outside of the technology sector that has been red hot for months — are perking up and looking ready to run higher. Boeing (NYSE:BA) shares are breaking up and out of their upper Bollinger Band, returning to the highs set in February and tested in June. Investors have been encouraged by recent reports of overwhelming demand for new airliners and excitement over the coming folding-wing 777 variant, setting aside trade war concerns. The company will next report results on July 25, with analysts looking for earnings of $3.40 per share on revenues of $23.9 billion. When the company last reported on April 25, earnings of $3.64 beat estimates by $1.05 on a 6.5% rise in revenues. 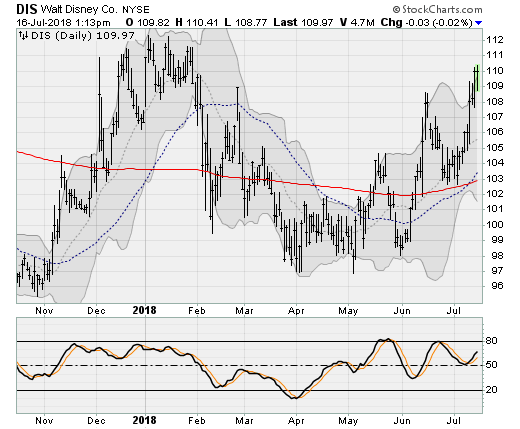 Disney (NYSE:DIS) shares are surging back to the highs seen at the start of the year as it becomes clear the company’s bid for 21st Century Fox (NYSE:FOXA) is likely to carry the day against rival Comcast (NASDAQ:CMCSA). Investors are also encouraged by solid results for the “Ant-Man” movie. The company will next report results on August 7 after the close. Analysts are looking for earnings of $1.97 per share on revenues of $15.3 billion. When the company last reported results on May 8, earnings of $1.84 per share beat estimates by 14 cents on a 9.1% rise in revenues. 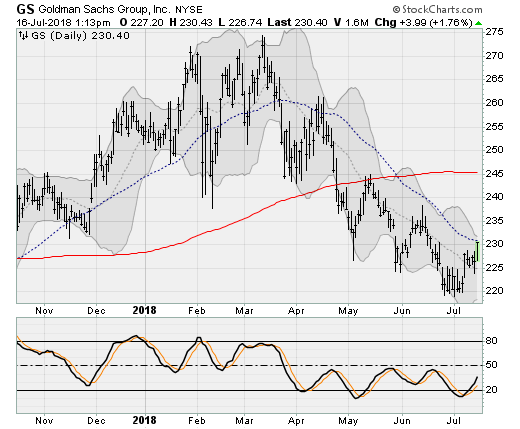 Goldman Sachs (NYSE:GS) shares are reversing higher and look set to push back over their 50-day moving average, ending a downtrend going back to March. Bank stocks, including GS, have been hit by rising short-term interest rates and falling long-term rates — pressuring earnings expectation by lower interest-margin hopes. The company will report results on July 17 before the bell. Analysts are looking for earnings of $4.65 per share on revenues of $8.7 billion. When the company last reported on April 17, earnings of $6.95 beat estimates by $1.38 per share on 25% revenue growth. 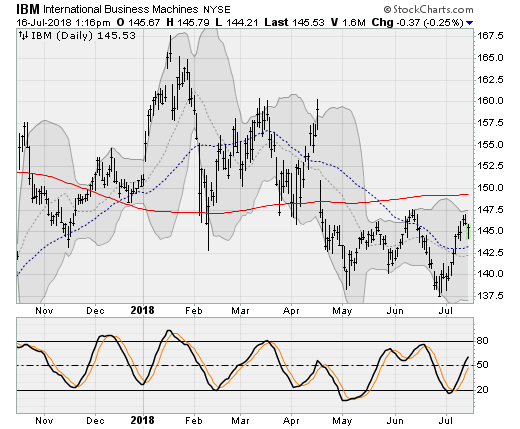 International Business Machines (NYSE:IBM) shares are bumping up against four-month resistance as it continues to coil up beneath its 200-day moving average. 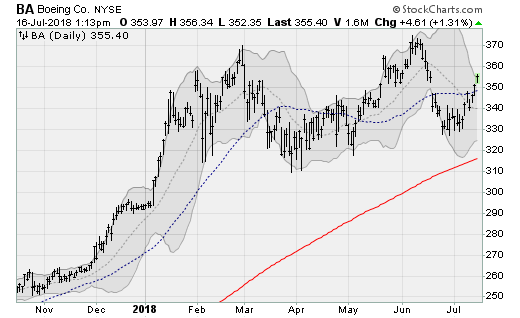 The result was a test of the summer 2017 lows, setting up a challenge of the dominant 2017-2018 trading range near $155 — which would be worth a 7% gain from here. The company will next report results on July 18 after the close. Analysts are looking for earnings of $3.04 per share on revenues of $19.9 billion. When the company last reported on April 17, earnings of $2.45 per share beat estimates by three cents on a 5.1% rise in revenues. 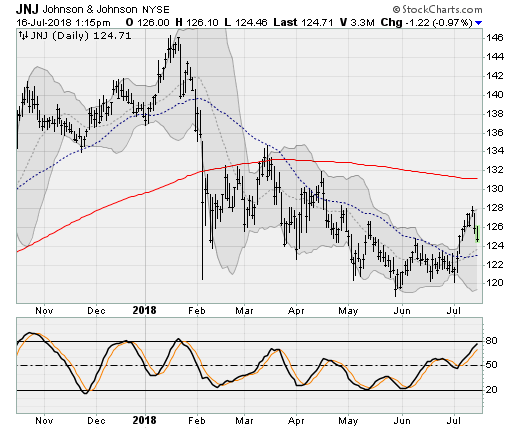 Johnson & Johnson (NYSE:JNJ) shares broke out of a year-to-date downtrend earlier this month, and is testing the breakout above the 50-day moving average. Watch for a run at the 200-day moving average, which was last crossed in March. Shares have been weighed down by negative headlines surrounding a lawsuit connecting baby powder to ovarian cancer. But with a St. Louis jury returning a $4.7 billion verdict, investors are starting to look beyond the risk. The company will next report results on July 17 before the bell. Analysts are looking for earnings of $2.07 per share on revenues of $20.4 billion. When the company last reported on April 17, earnings of $2.06 per share beat estimates by six cents on a 12.6% rise in revenues. 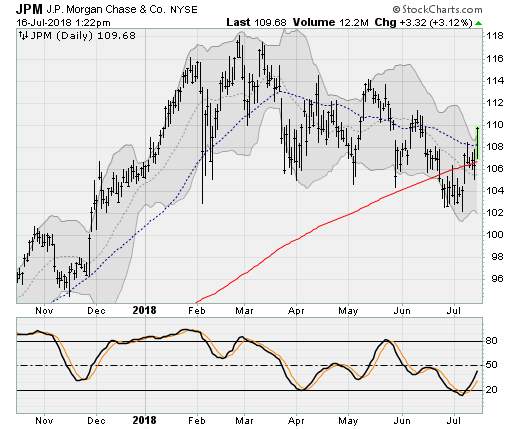 JPMorgan (NYSE:JPM) shares are breaking higher following earnings, threatening to push up and out of a downward tilting trading range that’s been in place since February. The company reported on July 13, with earnings of $2.29 per share beating estimates by seven cents on a 9.1% rise in revenues. Of the big banks that have reported thus far, the company’s 14% return-on-equity tops the chart thanks to a 12% rise in trading revenue growth. The company will next report results on Oct. 12 before the bell. Analysts are looking for earnings of $2.29 per share on revenues of $27.4 billion. 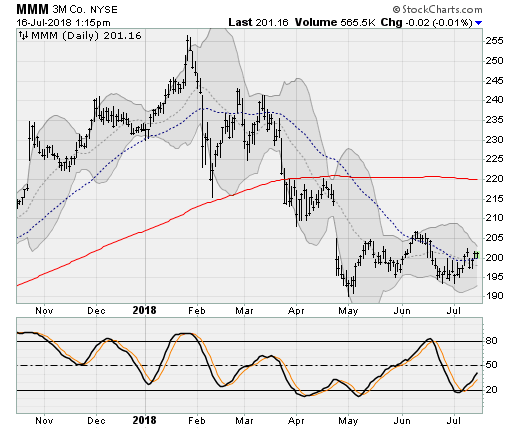 3M (NYSE:MMM) shares have quietly inched up and over its 50-day moving average, retaking its 50-day moving average, capping a four-month consolidation. The company has had minor exposure to the deepening trade spat between China and the United States, which along with general investor disinterest in industry stocks lately, has pushed prices down more than 20% from their January high. The company will next report results on July 24 before the bell. Analysts are looking for earnings of $2.60 per share on revenues of $8.4 billion. When the company last reported on April 24, earnings of $2.50 beat estimates by two cents on a 7.7% rise in revenues. 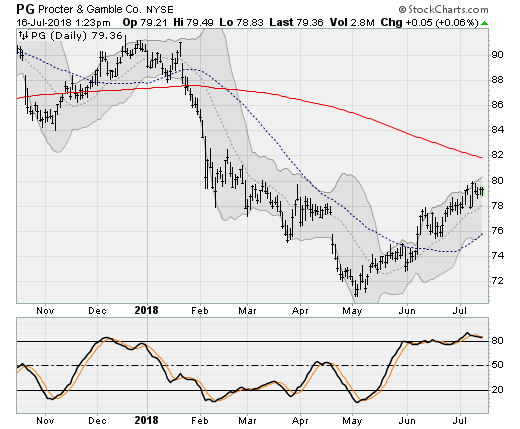 Procter & Gamble (NYSE:PG) shares have enjoyed a professional-looking, steady-state rise out of their early May lows, closing in on the 200-day moving average. The 200-day moving average looms just ahead, which would clear the way for a move towards the highs above $90-a-share set late last year. The company will next report results on July 31 before the bell. Analysts are looking for earnings of 90 cents per share on revenues of $16.6 billion. When the company last reported on April 19, earnings of $1.00 per share beat estimates by a penny on a 4.3% rise in revenues. 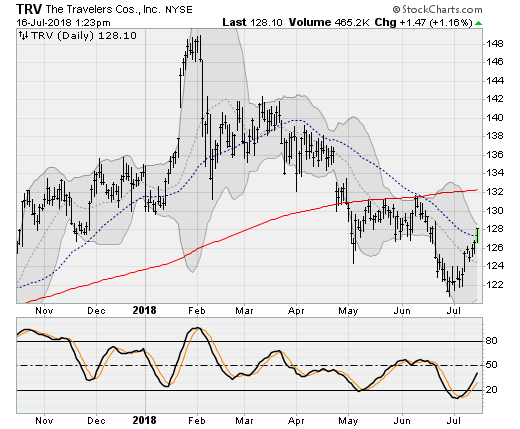 Travelers (NYSE:TRV) shares have perked back up and over its 50-day moving average, ending a downtrend going back to March, setting up another re-test of its 200-day moving average. Shares have been in a steady pattern since the 2011 U.S. credit downgrade low, continuing a persistent upward march with occasional buying dips along the way. The company will next report result son July 19 before the bell. Analysts are looking for earnings of $2.43 per share on revenues of $6.7 billion. When the company last reported on April 24, earnings of $2.46 missed estimates by 23 cents on revenues of $6.5 billion. 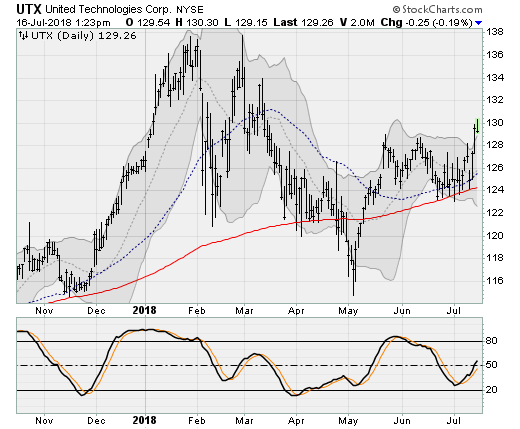 United Technologies (NYSE:UTX) shares have punched up and over its May/June reaction high, clearing the way for another run at the January-March highs near $138. The company has been exposed to the U.S.-China trade fight via its aircraft engine division, but with the narrative lately changing to the huge number of aircraft backorders, investors are warming up to the name again. The company will next report results on July 24. Analysts are looking for earnings of $1.87 per share on revenues of $16.3 billion. When the company last reported on April 24, earnings of $1.77 per share beat estimates by 26 cents on a 10.3% rise in revenues. 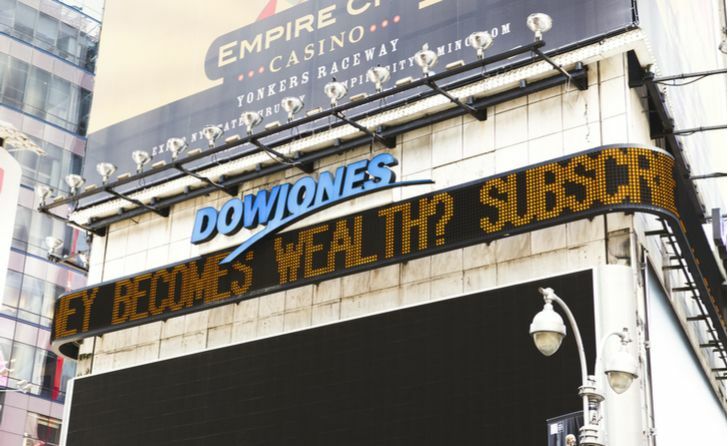 Article printed from InvestorPlace Media, https://investorplace.com/2018/07/10-dow-jones-stocks-to-buy-now/.